CHRISTMAS CAROLS! 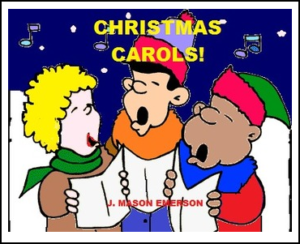 (FUN PACKET FOR ALL INCLUDING SPANISH ELL’S) presents selections from Christmas carols in English as well as gives the Literal (word-for-word) Spanish, which makes it easier for students of Spanish-language backgrounds to understand the English words in the carols better and thus be able to more easily and quickly learn them and get an accompanying boon for their vocabulary and grammar. Some German carols have also been added, with the Literal English given for them. List Of Popular 1900s-2000’s Christmas Songs. So, the price and time for this resource are right, and you will love seeing your students glad to stay busy as bees enjoying this learning pack a lot, so consider getting it now. REASONS TO CONSIDER PURCHASING FROM THIS STORE: 1. Tons of resources, 2. so much reusable over the years ahead, 3. buying it is more convenient than trying to make it yourself, 4. students enjoy the fun components so that they stay more on task learning more and better, 5. most word searches have a format helping teach information with the words, 6. most resources have reading components tied into with other components making them more handy and helpful, 7. They have an attractive, professional appearance, 8. Many resources have some Spanish to help ESL/ELL students to not be totally left out; 9. the prices are right; and, 10: you’ll love it that your students stay busy learning like happy bees at the honey hive of knowledge, your classroom, even as they have in mine since these have been teacher and students-tested. THE SPANISH used in some resources in my store is more the informal Latino Spanish actually used by most students from Latin America than the formal Castillian of Spain; so there are some differences in grammar, spelling and or vocabulary even as there are with American and British English.